The Erector Spinae is made up of a group of muscles that originate from the T9-T12 and insert onto T1 and T2. The primary action is to extend the vertebral column. 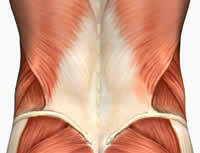 The opposing muscle is the abdominals or rectus abdominis. What about lower back pain? Call a doctor to make an appointment. They will most likely refer you to a specalist or physiotherapist. Here is a more advanced workout for your lower back. Are there specific exercises for men and women? No, any exercise that a man can do, a women can do too. There isn't any difference in exercises that anyone should do based on your gender. What lower back exercises can I do while lying on a couch? You can do the back hyper-extensions by raising each arm and opposing leg at a time as shown above.